For the 2003 Edgar awards program book. The first two books I ever checked out of the Seldovia Public Library were The Hidden Staircase and The Clue in the Old Stagecoach. Yes, I loved them, and yes, they returned me hotfoot to the library, where, yes, I went through the rest of the Nancy Drews on the shelf in about a month. But after that? I didn’t read mysteries much. My mother loved them, especially those of British authors, including Ngaio Marsh, Dorothy L. Sayers, and Agatha Christie. Perhaps, in the perverse way of children, because she did, I didn’t. She didn’t give up, though. It took her twenty-one years of patient persistence to get me to read Josephine Tey’s The Daughter of Time. It was a revelation. To this day, The Daughter of Time remains the finest crime novel I have ever read, and one of the finest novels of any kind. In it, a policeman is confined to a hospital bed, literally unable to sit upright, and from that bed he solves a double homicide committed four hundred years before. The crime scene is sixteen generations out of date, there is no surviving forensic evidence, and the chroniclers of the time only prospered through patronage, which could and did influence their reporting. And yet, Tey’s hero prevails, and this in spite of the fact that he spends the entire first paragraph staring at the ceiling. Yes, really, and in this era of kiss kiss bang bang yet another reason to marvel at the craft of this novel. The plot is above reproach, perfectly paced and sustaining of tension throughout, an extraordinary accomplishment when you realize that the facts of the case have been known for over four centuries. Tey takes the murder of the Princes in the Tower as her text, and in a completely convincing exercise of revisionist history exonerates Richard III, the man history has judged guilty of the crime. Ouch. After that, I won’t even mention Tey’s character assassinations of Mary, Queen of Scots and Sir Thomas More. Reading The Daughter of Time was my epiphany. In that moment, I realized you could do anything in detective fiction, so long as a) there was a mystery, and b) by the end of the book that mystery was solved. I launched an extensive remedial reading in the genre, working up from Nancy, Frank and Joe to Travis, Kinsey, and Cadfael. I learned that most detectives were loners, with barely a working relationship between them. I learned that a lot of them weren’t professional police officers or even licensed private investigators, but Flavian imperial agents and archaeologists and jockeys and salvage consultants and monks. I learned that most of these were cordially disliked by their official counterparts on the local police force, but not all. I learned that despite their frequently cynical and world-weary surface they shared a rock bottom resolution to fight for the right. You read that many detective novels and you develop an itch to write your own. The Daughter of Time started me down the road that led to Kate Shugak and Liam Campbell, and I will be forever grateful to Josephine Tey for the nudge. Pardon? Oh. You wanted to know whodunit. I lived in Anchorage for 3 months on a travel assignment and discovered your books at the library. I read most of them during that time. Kate became so much a character that I liked that I thought this author must be like Kate and I wanted to meet you so much. I thought you would have to live this to be able to write about it this good!! Since being back home I read the new book and look forward to more, if you come to Ga. look me up and I’ll show you some Southern Hospitality. I loved Alaska and have a yearning to return. to Barb–I hope it’s on hold for months! But of course you get it first. to Wanda–What a wonderful compliment, thanks so much. I agree; Daughter of Time is one of my “desert island dozen.” Mysteries to Die For here in Ventura County, California, had it just a few months ago for their monthly book club. It’s always fun finding that your or Kate’s favorite books are mine, too. Heinlein is perhaps common, but Gerry Durrell’s “My Family and Other Animals,” not so much. Yes! DoT is one of my favorites. Thanks so much for posting this and reminding me that it’s time to reread it. Daughter of Yime was one of the first mysteries I read as a very young woman. I was amazed that a book that essentially took place in a hospital room could be so engrossing. The book whetted my interest in history AND mysteries. I am a recently retired English/American Studies college teacher , and while what the bookstores call “literature” (as opposed to “fiction”) has been my stick-in-trade, mysteries hold equal pride of place on my bookshelves and nightstand. DoT turned me into a raging Ricardian. I had a discussion with a gentleman when I was living in England that gathered a crowd in the White Tower, with various tourists and Beefeaters cheering and jeering aloud. Love that you love this book. 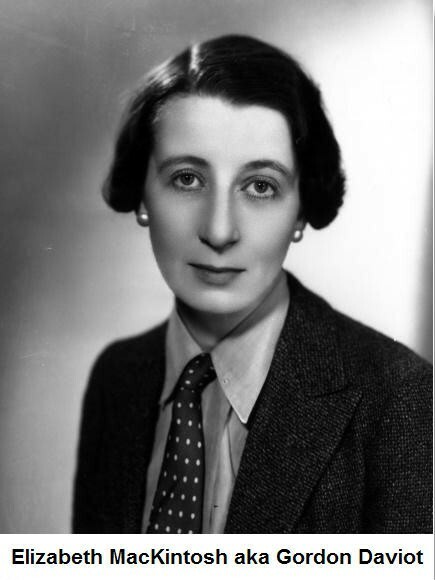 My thanks to Josephine Tey! Wow, Dana, thanks for re-posting this. My Mother, like yours, had a lot of mystery books. Unlike you, I read them all, and so grew up reading Ngaio Marsh, Agatha Christie, and Josephine Tey. DoT was one of my favorites. I was at my Mom’s yesterday, and borrowed her Four Five and Six by Tey omnibus, which I believe is the very book I first read far too many years ago. It still rocks. Today at the library I took out Miss Pym Disposes, since I neglected to borrow her Three by Tey omnibus which includes it. How wonderful to revisit dear old friends. (At the Tower of London last summer I could be heard to say “But that isn’t what happened!”) Anyway, thanks again Dana, for the reminder. Raised in the British educational system, I loved the Famous Five mystery stories of Enid Blyton, never having known Nancy Drew. Later it was Agatha Christie, whose autobiography I recently read, and found fascinating! What adventure travel one could do in those days before the middle east became too dangerous into which to venture! By the way, Ngaio Marsh was a New Zealander, so, technically British, but not in the sense of English.